July | 2012 | Life is short,have fun!!! “Syrian rebels have captured a number of positions on the country’s borders with Turkey and Iraq. A senior Iraqi official said all the crossings on Syria‘s eastern frontier had been seized. At one point, two Turkish posts were also in rebel hands. The push came a day after a bomb claimed the lives of three senior defence officials in Damascus. The mandate for the mission is due to expire on Friday. There are almost 300 UN observers in Syria, but the mission suspended most of its monitoring activity in June, because of the risk from increasing violence. The US says it might consider a final brief extension of the monitors work, but warned that it could not pin its policy on an unarmed mission. The UK is said to be proposing an extension for a “final 30 days”. As the situation in Syria becomes more unpredictable and violent, the diplomacy in New York is lagging behind events on the ground, says the BBC’s Laura Trevelyan at the UN. The rebels, perhaps sensing that the regime was too preoccupied with the escalating battle for the capital, stormed all the posts on the Iraqi border, the BBC’s Jim Muir in neighbouring Lebanon says. The major Abu Kamal crossing on the Euphrates river in the east was captured after a clash with government forces, opposition activists said. More than 20 Syrian soldiers and their commander were killed when a remote army outpost in the far north-east was attacked, Associated Press news agency reported. Iraq’s government, seen as sympathetic to President Bashar al-Assad, has threatened to shut its side of the border and one official told Reuters news agency that it was closing the Abu Kamal crossing. On the frontier with Turkey, too, rebels were said to have taken control of two posts, at Bab al-Hawa and Jarablus. 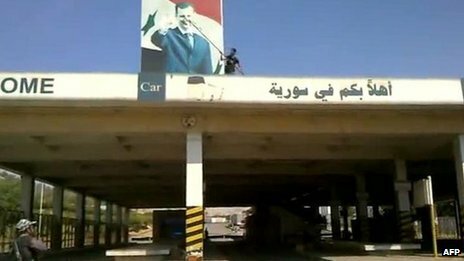 Video from the Bab al-Hawa crossing in Idlib province soon emerged of rebels defacing a portrait of President Assad, but they later reportedly withdrew from the position. 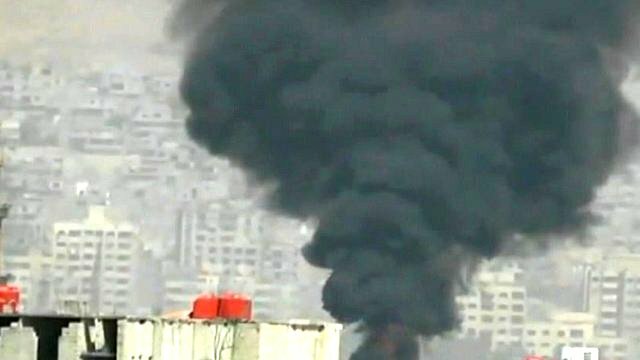 For four days, rebels have been involved in clashes in areas of the capital as they push their “Damascus volcano” operation against Syrian armed forces. The deaths of three top security officials has led to a mobilisation of government troops in an attempt to drive the rebels out of the city. The president’s brother-in-law, the defence minister and head of the government’s crisis team were killed by a bomb as they attended a meeting at the national security headquarters. The first images of President Assad since the attack have appeared, largely ending rumours he might have been hurt. The footage appeared to show Gen Fahd Jassim al-Furayj, chief of staff of the armed forces, being sworn into his new post as defence minister. Tanks and armoured vehicles were reported to have moved into Qaboun on Thursday, close to the centre of Damascus. There were heavy casualties, activists said, as a result of an army bombardment of Zamalka in the eastern outskirts of Damascus. The mood inside the Security Council chamber was acrimonious after China and Russia vetoed the resolution. Britain’s ambassador accused the two nations of protecting a brutal regime by their actions. America’s ambassador said the council had failed utterly in the most important task on its agenda. China’s ambassador denounced what he called an uneven resolution which placed pressure on one side, while Russia’s representative claimed the resolution would have opened the path to military involvement in Syria’s affairs. Now negotiations are under way to try to extend the mandate of the UN monitoring mission in Syria which is due to expire on Friday. The mission is supposed to monitor a ceasefire and support a political process – neither of which exist. So the UK is proposing a 30 day “final” extension. The London-based Syrian Observatory for Human Rights put the number of fatalities across the country on Thursday at 250. The pace of events in Syria was in marked contrast to the diplomatic stalemate at the UN Security Council, where Russia and China vetoed a Western resolution calling for tougher sanctions on Damascus. Under the Western-backed plan, the Damascus government would have been threatened with non-military sanctions under Chapter Seven of the UN Charter if it failed to move troops and heavy weapons from populated areas. But the use of Chapter Seven paved the way for “external military involvement in Syrian domestic affairs”, Russia’s UN ambassador Vitaly Churkin argued. 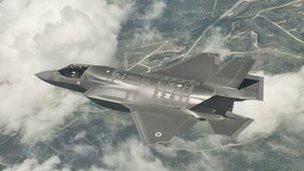 “It has been a long and expensive wait, but Britain has now been handed its first Joint Strike Fighter jet, also known as the F-35. Defence Secretary Phillip Hammond flew out in person to the searing heat of Fort Worth, Texas, for the official handover ceremony from its US manufacturer Lockheed Martin. He says it is “the best warplane money can buy”. But it is an eye-watering sum – the current cost of each jet is more than £100m. After watching Britain’s first F-35 take to the skies, Mr Hammond said “this is money well spent”. He said it would give the RAF and Royal Navy “a world class fighting capability” with the ability to “project power” off the two new aircraft carriers now under construction, anywhere in the world. So is it worth it? The UK is buying the short take-off and vertical landing variant – STOVL for short. It is the heaviest and most expensive of the three versions of the plane, carrying fan propulsion system for its “jump jet” capability, which it needs to land on the Royal Navy’s new carriers. The most obvious comparison is with the scrapped Harrier jet it is replacing. The Harrier had a range of 300 nautical miles, for the F-35 it is 450 miles. While the Harrier could reach a speed of 650mph, the F-35 can fly much faster – more than 1,200mph. The Harrier had no radar transparency or stealth capabilities, but the F-35 has both. Its acute angles and special coating make it difficult to detect on any enemy radar. BAE Systems test pilot Peter Wilson said the F-35’s stealth technology is “worth its weight in gold”. It means a pilot can enter and leave a war zone while staying safe. In theory, it can also carry a heavier weapons load than the Harrier, although the F-35B “jump-jet” is the least capable of the three versions of the new plane. But even with its cutting edge technologies, the F-35 has flown into a storm of criticism, particularly in the US where it has gained unwelcome notoriety as the most expensive equipment project ever undertaken by the Pentagon. The US is spending around $400bn (£254bn) to buy 2,500 F-35s for the navy, air force and marine corps. It is estimated that the total cost of buying, operating and maintaining the planes over the next 30 years will be $1tn. Winslow T Wheeler, at the US Center for Defense Information said it was a “gigantic performance disappointment”. Not as stealthy as the F-22 for example. He was referring to the cheap, mass-produced cars made in the former Yugoslavia. That may sound extreme, but even a more measured report by the US Government Accountability Office (GAO) highlighted serious problems including the management and development of more than 24 million lines of software code in the aircraft and faults with the helmet-mounted displays. The GAO report warned that “most development flight testing, including the most challenging, still lies ahead”. The F35 may be more like a thoroughbred race horse, but so far it has proved just as temperamental. The F35 – which will be called the “Lightning II” by the RAF and Royal Navy – is still a long way off from being battle ready. Though British pilots have already been involved in the test flying programme, they will not be flying the plane off UK bases or the two new aircraft carriers until 2018. And it is still not clear how many planes the UK will buy. The last Labour Government said the UK would buy 138 planes but Mr Hammond has so far committed to purchasing only 48. That number, over time, is likely to increase – not least because British industry is heavily involved in the project. The tail section of every plane is being made by BAE Systems. Overall the UK has a 15% share of the work, enough to sustain more than 20,000 jobs. I don’t know if this has happened to anyone else, but Google Now knows where I live. After 3 days on [Jelly Bean], I opened Google Now at work and it gave me time and directions to get back home. I thought it was cool and then I opened up Google Maps on my home computer. Lo and behold there is now a new, completely different looking icon where I live that is labeled home. I didn’t add it nor did I ever even search for directions back home. I’m not afraid of technology or anything, but that one was pretty odd. Now has access to a phone’s GPS information, i.e. location. As another Redditor points out, it makes sense that Google Now would figure out that “the area you [and your phone] spend 8 to 16 hours a night is your home.” Now will also figure out that the spot where you spend eight hours (or more, you workaholic) every day is your place of business. What I wonder is how our little friend Now will interpret aberrant data. And when I say “aberrant,” I mean the twenty- and thirty-something Android users who spend a few nights each week away from their homes. Will Google Now realize that a particular spot is your “boo’s home” or “that regrettable one-night stand”? Of course, little Now won’t have to deal with these aberrations as often as Siri will. According to OkCupid, iPhone users are more promiscuous than Android users, racking up twice as many sexual partners in their not-exactly-rigorous study. Still on this subsidy report…..
“The United States and Israel jointly developed the Flame computer virus that collected intelligence to help slow Iran’s nuclear program, The Washington Post has reported, citing anonymous Western officials. The so-called Flame malware aimed to map Iran‘s computer networks and monitor computers of Iranian officials, the newspaper said. It was designed to provide intelligence to help in a cyber campaign against Iran’s nuclear program, involving the National Security Agency, the CIA and Israel’s military, the Post said. The cyber campaign against Iran’s nuclear program has included the use of another computer virus called Stuxnet that caused malfunctions in Iran’s nuclear enrichment equipment, the newspaper said. Current and former US and Western national security officials confirmed that the United States played a role in creating the Flame virus. Since Flame was an intelligence “collection” virus rather than a cyberwarfare program to sabotage computer systems, it required less-stringent US legal and policy review than any US involvement in offensive cyberwarfare efforts, experts said. The CIA, NSA, Pentagon, and Office of the Director of National Intelligence declined to comment. Flame is the most complex computer spying program ever discovered. Two leading computer security firms – Kaspersky Lab and Symantec Corp – have linked some of the software code in the Flame virus to the Stuxnet computer virus, which was widely believed to have been used by the United States and Israel to attack Iran’s nuclear program. “Five infantry battalions are to be withdrawn and 17 major units in total axed from the Army in its biggest overhaul for decades. Troop levels are to be slashed by a fifth from 102,000 to 82,000, while the Territorial Army will be expanded to give a combined force of 120,000. The 2nd Battalion the Royal Regiment of Fusiliers, the 2nd Battalion the Yorkshire Regiment, the 3rd Battalion the Mercian Regiment, and the 2nd Battalion the Royal Welsh will all go in the shake-up. A fifth, the 5th Battalion the Royal Regiment of Scotland will be reduced to a public duties company to carry out public duties in Scotland. Defence Secretary Philip Hammond admitted in the Commons that the reforms would be “unwelcome” but insisted they would create a “balanced, capable and adaptable force” for the future. “After inheriting a massive overspend from the last Government, we have had to make tough decisions to implement our vision of a formidable, adaptable and flexible armed forces,” he said. “After a decade of enduring operations, we need to transform the Army and build a balanced, capable and adaptable force ready to face the future. As part of the changes, the Armoured Corps will be reduced by two units with the merger of the Queen’s Royal Lancers and the 9th/12th Royal Lancers and the 1st and 2nd Tank Regiments amalgamating. There will also be reductions in the number of units in the Royal Artillery, the Royal Engineers, the Army Air Corps, the Royal Logistic Corps, the Royal Electrical and Mechanical Engineers and the Royal Military Police. The plan – known as Army 2020 – will see the military split into two, with a reaction force ready to respond to emergencies around the globe and an adaptable force capable of carrying out a range of tasks and commitments. But the prospect of losing historic units has been the cause of intense anguish within the service. The Daily Telegraph disclosed this week that one officer, Brigadier David Paterson of the Royal Regiment of Fusiliers, had written to the head of the Army expressing his bitter disappointment at plans to axe one of its two battalions. In his letter to General Sir Peter Wall, Chief of the General Staff, Brig Paterson said the proposal “cannot be presented as the best or most sensible military option”. Mr Hammond has acknowledged that the plans, drawn up by Lieutenant General Nick Carter, have involved some “difficult” decisions. But he said that cuts could not be avoided, with the demands for strict financial discipline under the Government’s 2010 Strategic Defence and Security Review. For the plans to be successful, reductions in regular Army strength will need to be offset by increases in part-time reservists, with the Territorial Army doubling in numbers from 15,000 to 30,000. As well as providing specialist capabilities – such as medics and intelligence – reservists would be used to reinforce infantry battalions on deployment. They will be expected to shoulder a third of the burden of long-term operations. The Army will also be required to make greater use of civilian contractors in areas such as logistics support in order to concentrate military capability on the frontline. Shadow defence secretary Jim Murphy told Sky News: “You can’t make cuts in the British army of this depth and at this speed without it having an impact on our ability to project power, our influence in the world and the ability of the British army to be deployed on a sustainable basis at points in the future.